Government of Luxembourg asks ITU to deny license for Avanti’s Hylas 2 satellite. Curiosity’s tire tracks, made during 112 meters of travel in one month, visible in images from NASA’s Mars Reconnaissance Orbiter. AMOS-4 satellite set for Q2 2013 launch; GlobeCast will use AMOS-5 satellite for complimentary satellite services in Africa for Palaympic Games broadcasts. SES and Red Bee Media unveil remote recording service for satellite reception devices. Echostar showcasing comprehensive range of connected device solutions at IBC. Entropic Communications deploys Set Top Box system-on-a-chip and demodulator technology in three EchoStar models. Iranian government locates satellite operator willing to lease or sell an in-orbit telecommunications satellite, providing the country a placeholder for it’s expiring orbital slot assignment. Astrium ready to launch European polar orbiting weather satellite Metop-B. 35 year old Voyager 1 soon to be first man-made object to leave the solar system. Intelsat S.A. announces that Astrium Services Business Communications has expanded its capacity on Intelsat’s Ku-band mobility infrastructure. Gilat Satellite Networks gets initial order for several thousand SkyEdge II-c Aries self-install customer premise equipment kits from one of Europe’s largest satellite broadband ISP’s in support of SES Broadband Services Ka-band consumer service rollout. SES Broadband Ka-band consumer service to launch in November 2012. Singapore Airlines launching In-Flight Connectivity as part of $50 million program to bring Internet and mobile data services to customers, even at 35,000 feet. ND SatCom wins broadcast uplink technology deal in Germany. IsoTropic Networks upgrades global satellite network to iDirect Evolution platform with iDX 3.1 software to reduce operating costs and grow the business. New Lasso satellite interface allows easy and affordable access to Globalstar satellite network for remote M2M monitoring applications. Selex Elsag selects Teledyne Paradise Datacom high power X-band PowerMAX SSPAs to expand NATO ground satellite communications systems in Belgium and Italy, and provide upgrades in Greece and Turkey. Eutelsat promotes readiness of satellites for ultra HD, triple-play, digital cinema, new-generation newsgathering, and more, at IBC 2012. KVH TracPhone V11 C/Ku-band terminal adds global C-band coverage to mini-VSAT Broadband network, receiving full FCC approval, including first-time approval for C-band on vessels under 300 gross tons. On Call Communications and Gray Television Group collaborate on combination of mobile satellite systems and 3G video encoders to create news gathering package for twenty Gray-owned news channels. Indonesia’s space agency to launch its two micro satellites LAPAN A-2 and LAPAN ORARI via India’s PSLV rocket later this month. First Intelsat EpicNG satellite, Intelsat 29e, will be Boeing 702MP. 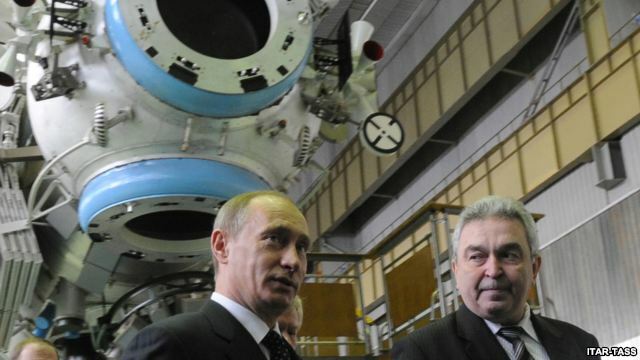 Russian President Vladimir Putin dismisses general director of Khrunichev Space Center, Vladimir Nesterov. United Arab Emirates and Kazakhstan hold satellite frequency coordination meeting. Joint space agency for Africa considered at meeting in Sudan of continent’s communications and IT ministers. Squire Tech Solutions serves hundreds of satellite Mobile Responder units in post hurricane response to Mississippi-, Louisiana-, and Arkansas-based teams. MTN’s yacht customers can now view HD content, with MTN’s VSAT connections using Jetstream HD streaming content solution. Hungarian company Magyar Telekom signs long-term AMOS capacity lease. Comtech Telecommunications Corp. gets $1.2 million order from defense contractor for solid-state high-power amplifiers for use in transportable satellite communications systems by U.S. military. inthinc selects ORBCOMM for global M2M communications service. DARPA program to harvest and reuse satellite components involves high school students. Thales Alenia Space Espana to present Paper “Security in IP Satellite Networks: . . .” at Sixth International Conference of Advanced Multimedia Satellite and Signal Processing for Space Communications. HTS Paradigm Shift – Industry views of High Throughput Satellites change dramatically over past five years. NSR 3rd edition, SCADA/M2M Via Satellite report available in October. NSR 5th Edition, Global Direct-to-Home Markets report available in September. This entry was posted on Friday, September 7th, 2012 at 8:40 pm	and is filed under Front Page. You can follow any responses to this entry through the RSS 2.0 feed. You can leave a response, or trackback from your own site.